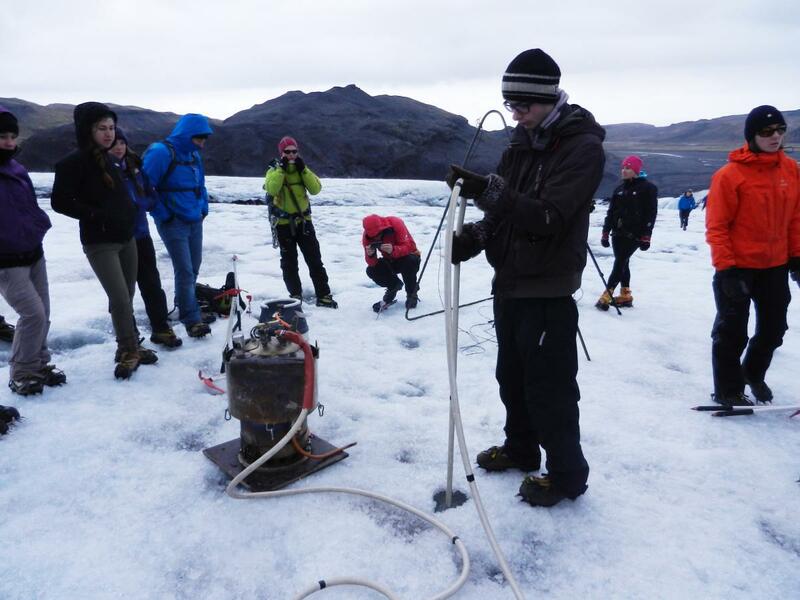 As a part of the course in glaciology the students started ablation measurements on 2 locations at the snout of Sólheimajökull. 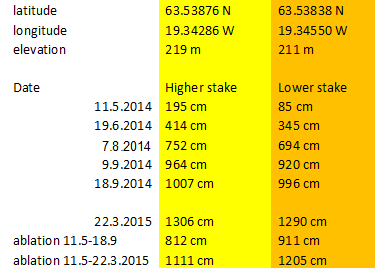 We expected considerable ablation during the summer and it is interesting to be able to quantify the ablation during the summer. 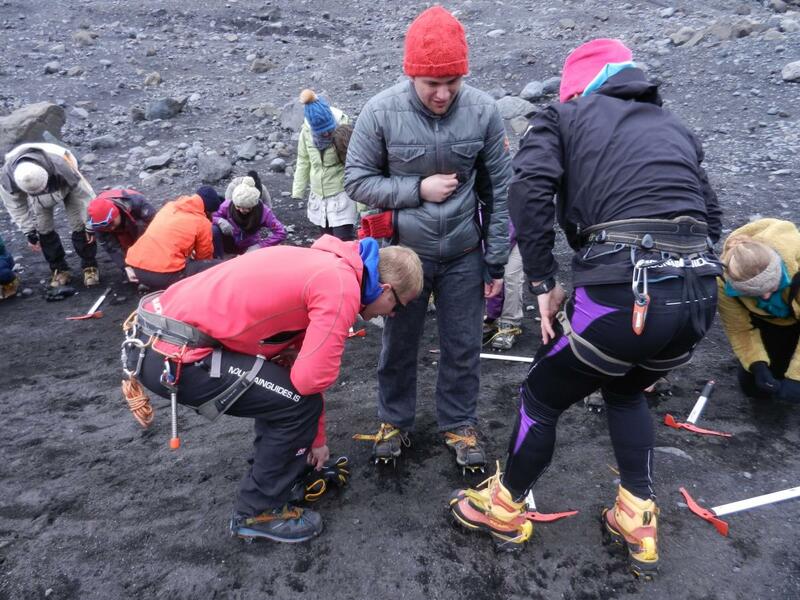 We got assistance from the Icelandic Mountainguides (http://www.mountainguides.is/), they lent the whole group crampons and ice axes and guided us up to the measurement locations. 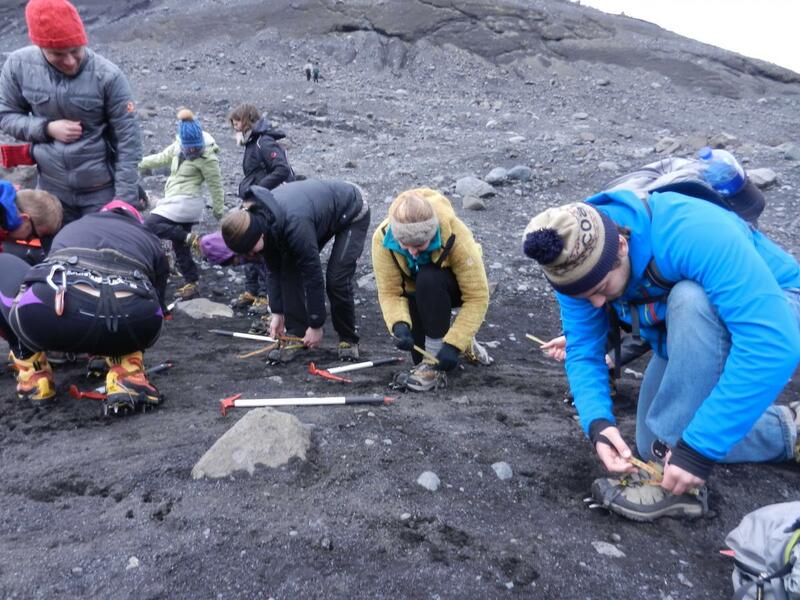 Some of the students are trying crampons for the first time and some discussion about the best way of fastening them was made before the trip on the glacier (photo Guðfinna Aðalgeirsdóttir). 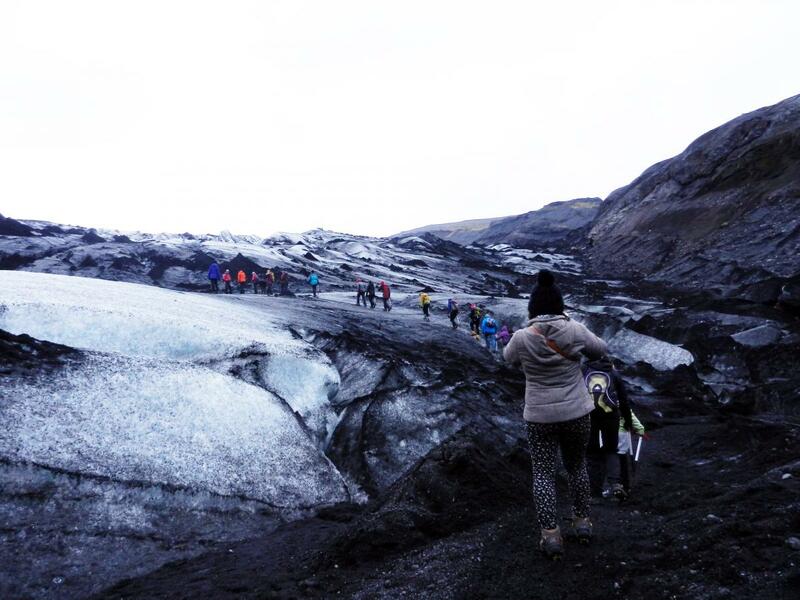 When everyone was ready the walk onto the glacier started under the guidance of glacier guides from Icelandic Mountainguides (photo Guðfinna Aðalgeirsdóttir). 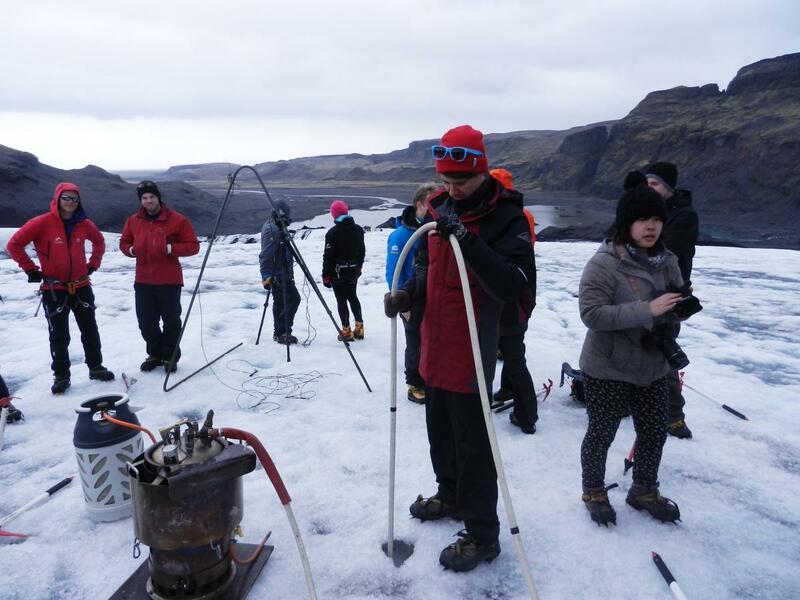 The drill is ready when the water is boiling and the pressure in the steam drill has increased enough for the steam to come out of the hose (photo Guðfinna Aðalgeirsdóttir). Students took turns in drilling the hole and both holes where about 12 m deep. In the back the the wire that went into the hole and the triangular stake can be seen (photo Guðfinna Aðalgeirsdóttir). 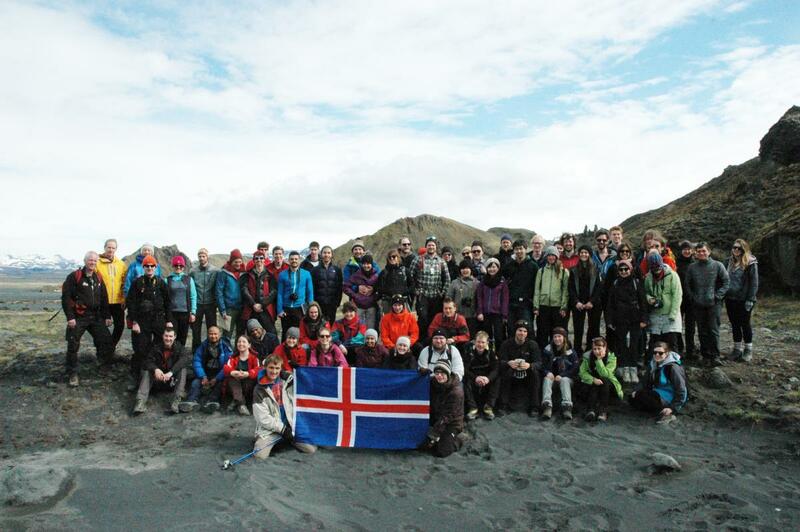 The group that participated in the excursion 10-11 May 2014 (photo Þorsteinn Sæmundsson).